Home / Blog / Once again, we're the best Printing Service in Regina according to Prairie Dog readers. Once again, we're the best Printing Service in Regina according to Prairie Dog readers. Every year Prairie Dog Magazine's "Best of Regina" poll asks readers to vote for their favourite local businesses, services etc. in various categories. Last year Prairie Dog added a category for "Printing Services" which we won. We're proud to announce that we won again this year. Prairie Dog is Regina’s news, arts, and entertainment magazine. Since 1993 Prairie Dog has been the essential guide to city living in Regina. Independent and locally owned. Thanks to everyone who voted for us! We're so proud and happy to know that we're your favourite print shop in Regina. Run down the checklist for a good printer. You need them to be responsive and listen to your needs. You need them to do good work with attention to detail. You need them to be affordable. And on occasion, you need to turn something around really, really quick because you left it to the last minute and Jesus, you’re only one person here. FloPrint is solid across the board, a reputation they’ve built and maintained for years. They’ve got the full range of printing services –– shirts, business cards, all of it –– and the Queen City’s creative types aren’t shy about using them. 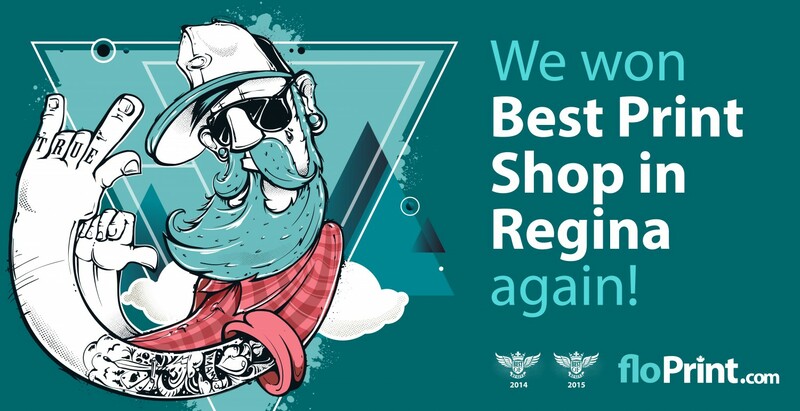 Voted "Best Printing Services" in Regina, 3rd year in a row!